I got to Wewelsfleth Germany around 19:00 last night, I had hard time to find the place I was going to stay at, I saw a man smoking a cigarette outside a bar, asked him if he knew how to get to the address I had written down, he had no idea, I went into the building asking others no one new. I found a map of Wewelsfleth Germany further down the main street, could not find the name of the street I needed to goto on that map. I saw too ladies walking further down the street, so I approached them and asked, they were locals and they knew the place I was going to stay at, they gave me the direction. The two ladies also told me that Wewelsfleth has many shipyards and that many of the people in Wewelsfleth are guest workers. The river Stör flows by Wewelsfleth and out into Elbe. I followed the directions to the house, when I got to the house there was note on the front door written in German. What I could make out was that they proprietarie was out and I could get the key from the neighbour. I headed towards the neighbour when a lady came cycling towards the house, turned out that she was the owner and that the ladies I had talked to earlier told her that they have met me. She showed me around – the room was large, with double bed – shared bathroom, it was really nice. I had a shower and jump into bed. My best sleep so far on my trip, really rested when I got up. Had a nice breakfast, before heading out of Wewelsfleth, I first cross the river Stör over the bridge, biking to the ferry that would take me over the river Elbe. The trip over Elbe on the car ferry took me 15 minutes. I took the road 495 towards Hemmoor, after a good ride I arrived in Hemmoor, it was from the Portland cement factory in Hemmoor that the concrete was delivered for the statue of liberty in New York. My next target was Osterholz-Scharmbeck, the ride went through many small towns, I got a puncture just outside the town of Ströhe, I changed the inner tube and went on my why, I had to stop again as the tire was not hard enough so I added more air. Just on the outskirt of Osterholz-Scharmbeck disaster happen, my chain came off struck a spoke that broke 8 more spokes, this was utterly a disaster, I assessed the damage, there was nothing I could do – I needed a new wheel as two spokes had been pulled of the wheel frame, I needed a new wheel. 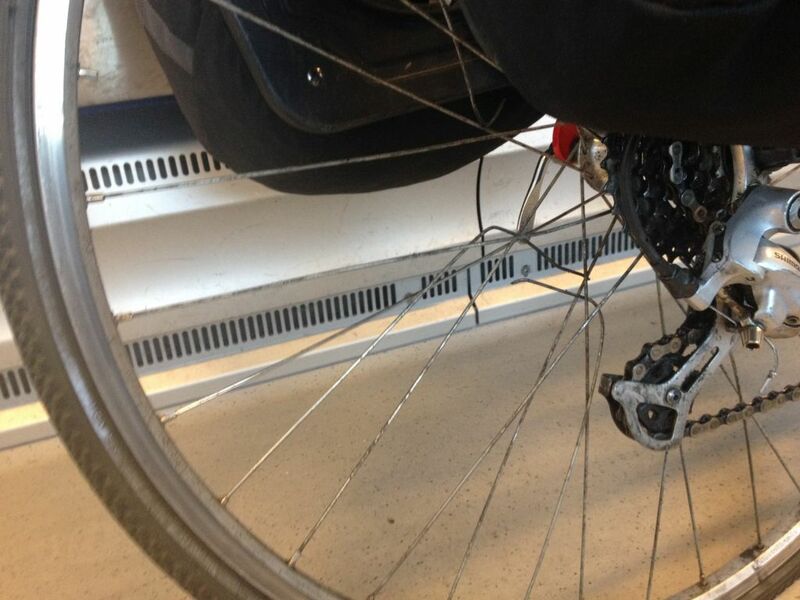 I tried to push my bike, did not work as the wheel was pushed against the frame on one side, I start adjusting the remaining spokes tills I found an optional setting so i could push my bike. My plan was to find a bike store, while I was working on my bike a lady pass by with a dog, after a few minutes she came back, asked if I needed help, I said yes, I need to find a bike store. She said she will help me, she asked if I could get to the road that was running underneath the main road, I said I be there in 10 minutes. She went home to get her car, I got to the decide meeting spot, she came we loaded my bike and she drove me to the bike store in Osterholz-Scharmbeck. At the bike store they took a look at my wheel, said it needed to be replaced confirming what I had concluded. They start measuring my old frame and tried to find a match of wheel frames they had in stock, unfortunately they did not have any, so they called the other bike store to check and they had nothing that matched my wheel. After another call they guy at the bike store told me that he could get a wheel within 74 hours, I thought about my options. I choose option 3, I tanked the bike store guy in Osterholz-Scharmbeck, headed to the train station, canceled my reservation for Oldenburg, got me a ticket to Amsterdam. I had 3 train changes on my way back to Amsterdam, I had to change trains in Bremen, Leer and Groningen. The trip back on the train took 6 hours, it felt good, I had to leave my bike at the train station as I could not take it on the tram to my house. I pick it up tomorrow, to take it to my local bike repair guy. End of Journey – did not reach all the way back, I could always ride the distance on another day. The route I rode before the bike broke down. Some picks of the day and my broken bike. No there is no bridge over Elbe at Wischhaven over to Gluckstadt, there is a car ferry that you can use to take your bike on.